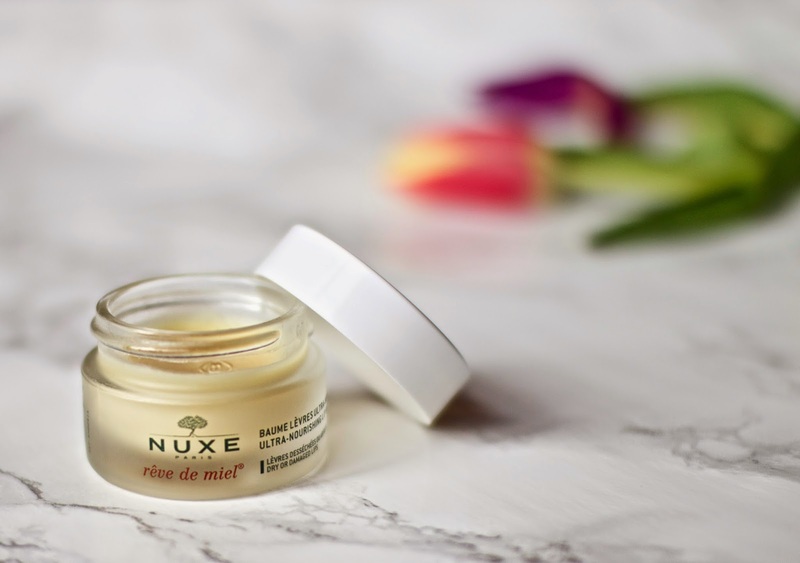 The Nuxe Rêve de Miel lip balm (£10) is easily my favourite skincare product I own. Without this, my lips would be sore and chapped – even in the summer months. I’ve tried countless lip balms in the past, none of which repair my lips anywhere near as well as this one. This has been my saviour for just over 3 years now, and I can’t imagine I’ll ever find another lip balm that will knock this off the top spot. The description provided by Nuxe says that it’s an”ultra-nourishing lip balm with honey and precious oils”. Fancy. The balm is paraben free and contains at least 78% natural ingredients. The blend of honey, sunflower, musk rose, almond oils, shea butter and grapefruit essence create a beautifully delicate citrus smell that I absolutely love. It kind of reminds me a bit of orange flavoured chocolate, which is obviously pretty damn wonderful. Sidenote – it does not taste like orange chocolate, but is definitely pleasant enough if you accidentally lick your lips. The texture of this is unlike anything I have ever tried before. It’s quite thick, waxy and slightly gritty. It sounds pretty awful, but I promise it’s the best feeling ever slathering this on your lips. As it’s such a thick consistency, you only need a small amount and the grains dissolve with the heat of your lips and fingers as you rub it in. I’d say this was more like a lip mask than just a lip balm. Unlike other lip balms, this lasts a really long time on the lips before you feel the need to reapply. When I wake up in the morning, I can actually still feel this on my lips from when I applied it right before I go to sleep. Using this only at night as a treatment would probably be enough for you if you don’t suffer with really dry lips, but want juicy and plump looking lips. However, I also apply this in the morning as part of my skincare routine. The balm is actually a matte finish, so can be used under lipsticks without the fear of having bright red lipstick slipping all over your face. As you can see, I have used about a quarter of the tub. However, when you open the product for the first time, it’s filled to the brim. A tub usually lasts me about 6 months, and I’ve been through about 7 of them now! I’m addicted! Aside from the fact that the actual product is incredible, the packaging is pretty lovely too. It’s housed in a weighty, frosted glass container that makes me feel all kinds of fancy. I know that some people may feel that £10 for a lip balm is quite expensive, but when it works so well, looks and smells so nice and lasts so long, I actually think it’s a bargain. If you’re a bit of a scatterbrain like me and fear you might lose it, just leave it at home. It’s so moisturising that you probably won’t need to reapply throughout the day anyway! Available at Space NK, Feel Unique, Cult Beauty, M&S and John Lewis. Have you tried this lip balm? Do you know of any other lip balms that you think I should try?